MANILVA scooter enthusiasts Pist’n’Broke – Sabinillas Scooter Crew, in collaboration with Manilva’s Sports and Youth Department, headed by Agustin Vargas, recently presented this year’s III Sabinillas Scooter Day, to be held on Saturday April 23. The day kicks off at 10am when all the scooteristas gather at the Repsol garage in the centre of Sabinillas where there will be plenty of photo opportunities and a chance to see the scooters. This year, there will be Vespas and Lambrettas from Cadiz, Jerez, Malaga and Marbella on show. 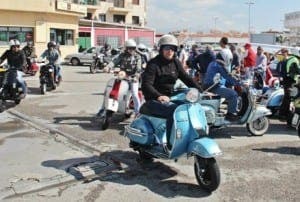 At 11am the scooters head off on a ride out, taking in San Martin,Sotogrande, Manilva, and back to Sabinillas. After a spot of lunch the action shifts to the promenade in Sabinillas where there will be a free concert starting at 5 pm with Malaga ska, rocksteady and reggae outfit Mentally Ska’d. At 6pm it is the turn of 70s mod revival stars ‘The Lambrettas’ who will be performing their latest tracks along with some old favourites including hits such as ‘Poison Ivy’, etc. The bands will continue alternating sets until 11 pm when the party transfers to La Mecedora, on the main road between Sabinillas and Duquesa Port, where a number of DJs will keep you dancing to classic mod, northern soul, Motown, Trojan, hits until the early hours of the morning. There will be snacks available and the concert and party are open to everyone.